A few years ago, when I was working "for the man" full time, I would walk into work every day. It took about forty minutes through Islington and Clerkenwell, two neighbourhoods in London. I did this for a couple of reasons: the fitness benefits were obvious; plus starting and ending work with a walk helped clear the mind for the next part of my day. The downside of walking to work is that it's impossible to read. Well, not impossible, but certainly difficult to do without being run over by a frustrated white van man or bicycle courier. A solution are audiobooks. 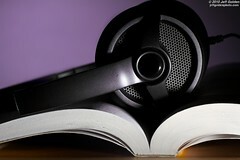 Audio books have joined the computer audio revolution; you can easily rip audiobook CDs in the same way as music, plus audiobooks are easily available as computer audio downloads on the likes of iTunes. So listening to an audio book on my walk was just a case of copying the computer audio files onto my smartphone to listen to as I walked. Just as it's possible to treat audiobooks in the same way as "regular" music, you still need to organise audiobook computer files to ensure they are easily navigable and searchable. After all, shuffling the order of a group of audio music tracks may not matter so much, but shuffling an audiobook may prove rather confusing! This is where I tend to start when I consider how to organise a group of audio files: title granularity. This is pretty difficult for classical music and podcasts, but for audio books it appears pretty straightforward. The title of the book should be tagged in the "album title" field. Chapters should be stored one per file, with its title and position stored in the "track title" and "track position" fields. So it's a pretty simple analogy of books containing chapters mapping to albums containing tracks. If you're listening to a ripped version of War and Peace then you're probably going to be dealing with multiple discs (unless it's very abridged). In this case I see little benefit in keeping these multi-disc demarcations. Musical artists have been known to construct albums based on the length of the available media and some may argue retaining this metadata is an important part of canonicalisation, but this doesn't apply to audiobooks. So, consider getting rid of track numbers and storing all chapters in one album. One alternative is to use "disc number" fields for book "volumes". I'd leave that to your discretion. The "artist name" field is probably the most difficult to decide upon. The key question is: narrator or author? It depends how you want to organise your audiobooks. If you want to search for a given book, you will probably be more likely to search by the author name. Therefore that's a good argument to use the author of the book as the audiobooks "artist", because the "artist name" tag is a standard one, shown prominently in all audio players. That said, the author could also sit in the "composer" field. Depending on whether your music player supports that field, it may be a better location. In MP3s and other file formats using ID3 there's the "Original lyricist(s)/text writer" tag TOLY. But, as ever, the limitation is whether your music player supports this. My thoughts on genres revolve around balancing a genre tree. In this case, if you only have a few audiobooks, using a simple "audiobook", "spoken word" or similar value for genre should suffice and will allow you to separate your audiobooks from other audio files. However, if you have a lot of audiobooks, or even operate a separate audio library comprising only audiobooks, you may want to consider using a genre describing the book more specifically. Maybe you could choose from Wikipedia's list of literary genres? Year of release, or year of writing? Similar to artist name, there's the question of whether the "year" field should contain data about the original composition of the work, or from this narration. If the former, you could use the first publication date as the "year". Otherwise, use the date of release of the audiobook. Have you been organising your audiobooks? Let us know how this went and what you learnt in the comments below! Thanks to Jeff Golden for the image above.